Bob, Not Bob! written by Liz Garton Scanlon & Audrey Vernick is illustrated by one of my favorite illustrators, Matthew Cordell. The premise is that poor Little Louie has the worst cold ever. “Today, Little Louie’s nose was clogged. Little Louie is beyond miserable. And so he calls his mom, she’ll make him feel better! 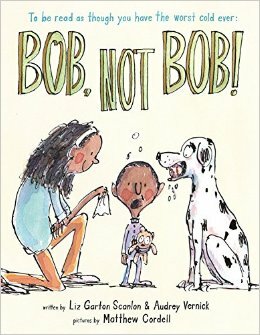 But when he calls “Mom” “with his weird, all-wrong, stuffed-up voice”, it comes out as “Bob!” and in leaps Little Louie’s big, slobbery dog, “Bob”. This scenario is repeated time and time again as poor Little Louie becomes more frustrated by his inability to communicate, his drooling pet, and his lack of Mom-healing attention. Oh my gosh, I’m Lol-ing now. So the text is funny enough, but this is where a brilliant illustrator takes a picture book to a whole other level. Matthew Cordell’s whimsical style is Quentin Blake-esque in their loose simplicity and the genius is being able to draw like that and yet inject so much character and ‘other part of the story’ into each expression and gesture. Cordell’s Little Louie flops this way and that, drool drips from Bob’s ball chomping mouth, and Mom runs about in all her chaotic Mom-ness. But my favorite little touch is that when Louie calls his “Mom” the text has a heart shape for the inside of the ‘o’ and when he refers to Bob the dog, the inside of the ‘o’ is oval. LOOOOOOOOVe this! Such a brilliantly subtle way to differentiate between the two. Talk about a fantastic read aloud? I was reading it aloud in my head trying to do my best stuffed nose rendition. And, if you have a cold? Well, definitely pick up this book for story time!!!! Audrey Vernick, Bob Not Bob, Jennifer Black Reinhardt, Liz Garton Scanlon, matthew cordell. Bookmark. This book would get a real workout during our long New England winters and nasty allergy season. Ha! That’s for sure, Lisa! Thanks so much for visiting Picture Book Builders! My kids looooove this book. Occasionally someone will just say the title and we giggle. That’s funny, Lindsay! So glad you like it! We read this one multiple times. Definitely a “10” on read aloud quality, humor and heart. 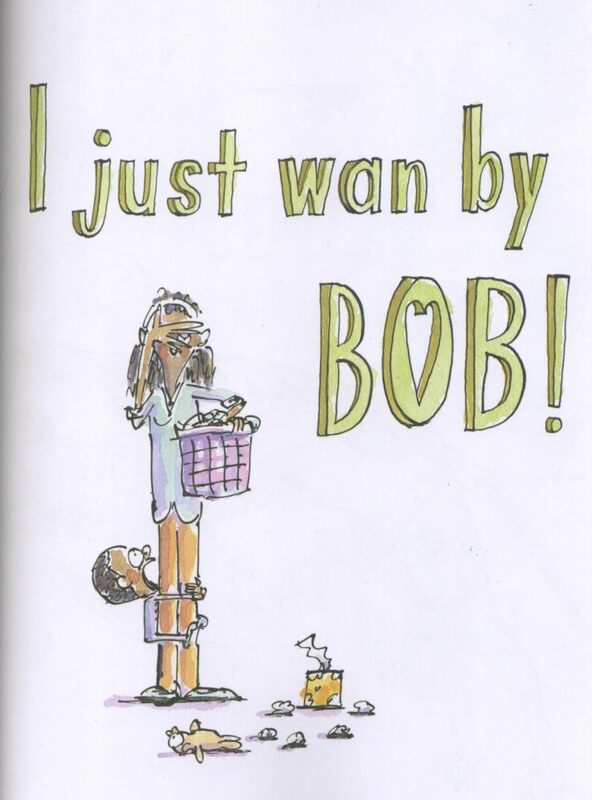 Hi Traci, glad Bob not Bob is a hit! This book is so much fun. Thanks for the post! Thanks for taking the time to visit and comment, Elizabeth! Hee hee, that would have been funny to see! 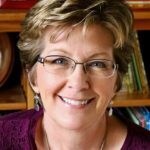 Hi, Kris, thanks for reading, today! It’s a very funny book! This was a fun one to read! Thanks for sharing it on your post today! Thank you, Judy, for stopping by and taking the time to comment! Have a great day! Loved this clever book! So fun to read! Thank you for sharing it. Thanks for taking the time to visit today, Danielle! Glad you liked the book! I’m adding this one to my wish list! Yay! Hope it makes you laugh, Linda! He gets so much humor and personality in a simple line! Thanks for commenting, Maria! What a fun book to read aloud to my two 6 year old granddaughters! I can hear their giggles already! Thanks! Perfect! And sure would cheer up a sick child if they were feeling under the weather. 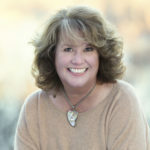 Enjoy, and thanks so much for visiting our blog, Sharon! How fun this would be to read to a preschool class! Yep! Guaranteed giggles! Thanks for visiting, Kathy! I love this book. Such a universal problem and misunderstanding that leads to belly laughing and giggles. I wish I had written it. You’re right, Cassie! And it’s funny in a lot of different ways. 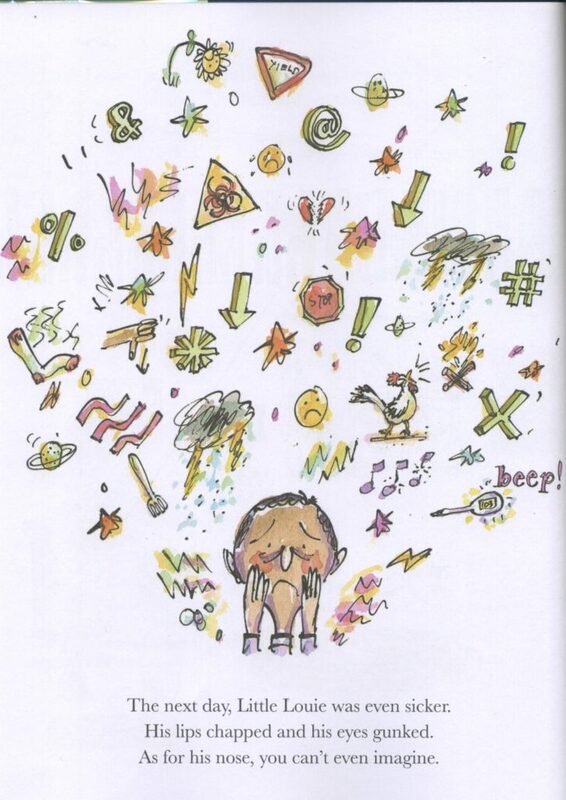 As an adult reading it, the overwhelming drama of everything being wrong in Little Louie’s world because he didn’t feel well was very relatable and humorous, too. Thanks for stopping by and taking the time to comment! This is such a fun book! Kids will relate! Hi Rachel! It is definitely giggle-making! Thanks for visiting! Thanks so much for taking the time to read and post about Bob, Jennifer. And we definitely have one thing in common–I am a big fan of Matthew Cordell too! It’s really a riot, Linda! Think you’ll like it! My head felt heavy just reading your excerpt! Love the humor and art! It’s a great book, Mary! Thanks for your nice comment! Your review made me laugh – can’t wait to read Bob, not Bob! Hi Claire! I’d say if the review made you laugh, the book will make you roar! Hope you enjoy it, thanks for visiting!